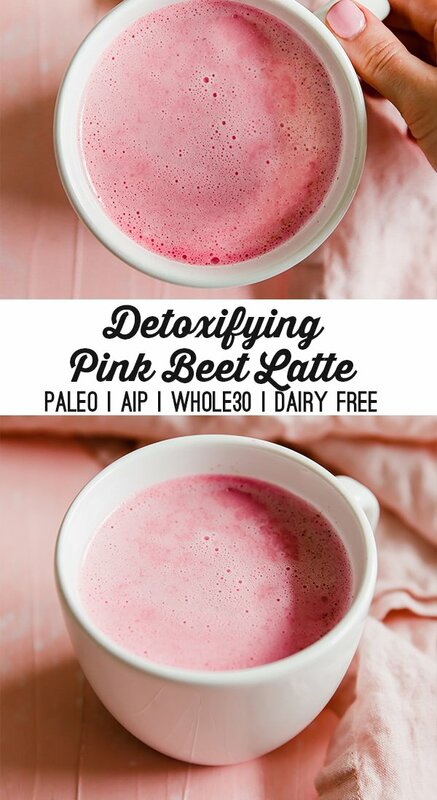 This detox pink vanilla beet latte is an amazingly cute and tasty liver loving latte! It’s dairy free, easy to make, and nutrient dense. Beautiful lattes are the best! We eat with our eyes first and a gorgeous latte with a beautiful color and some swirly milk is always a fun treat. 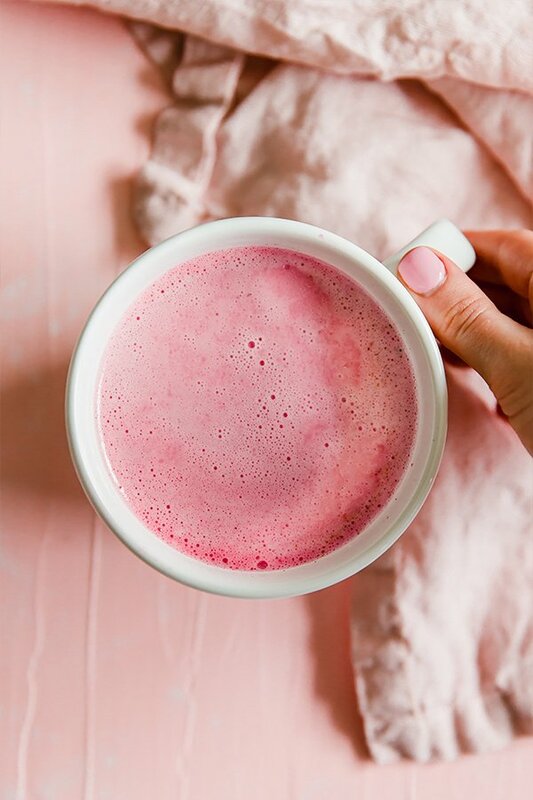 And with Instagram making lattes like golden milk and matcha lattes more and more popular, I think we’re all into the idea of yummy and healthy drinks. 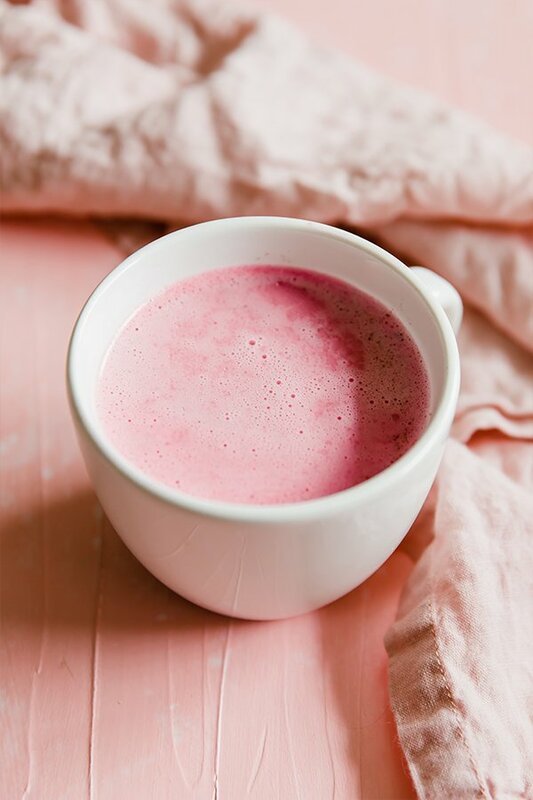 This beautiful pink beet latte isn’t just yummy and pretty, but it’s nutrient dense and supports a healthy liver! Now that’s a good latte! Beets are a superfood! Beets contain betaine which supports the healthy flow of bile which helps to support our liver working the way it was intended! They’re also rich in vitamin C which makes them a powerful antioxidant. And let’s be honest… the average person doesn’t really have a beet heavy diet. They’re one of those vegetables that we tend to neglect, so this is an amazing way to sneak some in. Wait… aren’t “detox” recipes spammy? Yes, and no. Yes if it’s a detox tea that promises miracle weight and fat loss. No, if it’s just real food that naturally supports liver health! The word detox is almost a dirty word in our society because it’s made out to be so spammy. People often say “why would I do anything to support detox if my liver already does that naturally?!”. Yes, our liver naturally does this, but our liver is also overburdened and can use some support. It’s like saying “Why are you wearing glasses?! Aren’t your eyes just naturally supposed to see well? !” See what I mean? It’s silly to think that the liver is for some reason the only organ in the body that’s immune from the world and doesn’t need any support. It’s quite the opposite. I’ve gotten a myriad of tests done by medical doctors in the past that have indicated that I have elevated liver enzymes and need extra liver support. It’s not delusional to accept that your liver can be overburdened and needs support. Our body can use some extra love and support if it’s overburdened, and as long as we’re either doing it with doctors guidance and/or with just with the healthy foods that we eat, it’s not spammy! How does our liver get overburdened? What are some signs that your liver could use some love and support? You suffer from estrogen dominance and hormone imbalance. Estrogen dominance is so prevalent in our society. Women that experience PMS, breast tenderness, mood swings, skin issues, and more can all potentially be dealing with estrogen dominance or hormone imbalance. You deal with fat malabsorption. Feel like you can’t digest fats? Like you eat a meal with fat in it and find yourself running to the bathroom? So many people say that fat just doesn’t work for them, but really, it’s an issue of digestion. You should be able to tolerate fats, as long as your liver is working properly. You have elevated liver enzymes. This is a test that any doctor can run via some routine bloodwork. If you’ve never had your liver enzymes tested, you can easily request your doctor to run it on a blood test! What can you do to support your liver? Work one on one with a doctor. This is always stepping one! You can’t drink enough beet lattes to replace support from a doctor. Removing excess sugars and adding more healthy fat and protein can help balance your blood sugar. Eliminate your exposure to toxins. Add the beet to a small saucepan and cover with water. Bring to a low boil and simmer for 30 minutes or until fork tender. Drain and allow to cool. Using a high-speed blender like a Vitamix, blend the beet with 1/2 cup of water until smooth. Place a fine mesh strainer over a large mug and pour the beet mixture through the strainer and into the mug. Use a spoon to push down the pulp to draw out any excess liquid. Save the pulp to add to soups, sauces, or mix it into the drink if desired. Heat the milk and coconut oil in a medium saucepan until warm. Stir in the vanilla, cinnamon, ginger, collagen, and honey. Whisk until fully incorporated and the collagen is fully dissolved. Use a milk frother if desired. Pour the milk into the mug with the beet mixture and serve warm topped with additional cinnamon if desired. Save time by buying precooked beets, like the Love Beet brand! These DIY apple cider vinegar are a nutrient powerhouse! They’re sugar-free and are easy to make at home. Health enthusiasts love apple cider vinegar. And what’s not to love? Taking shots of apple cider vinegar has been popular for quite some time and is only continuing to grow in popularity as it picks up on social media. So why not make it a fun DIY gift, and add some extra flavor with these DIY Apple Cider Vinegar Power Shots?! 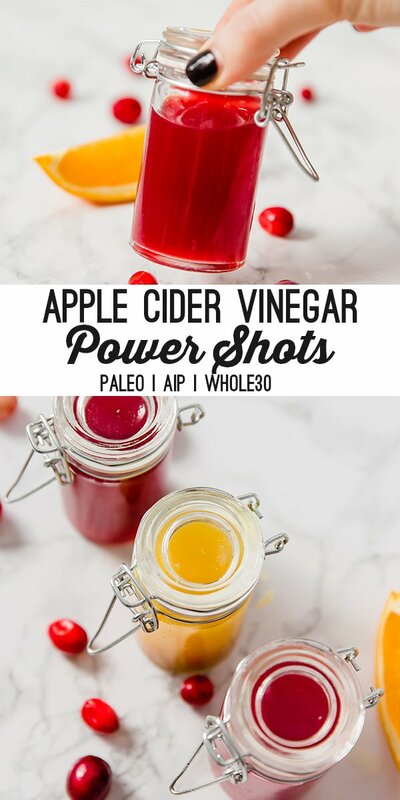 These apple cider vinegar power shots make the perfect little gift for that health enthusiast in your life. Maybe your sister is new to a healthy diet, maybe your work bestie is a runner, or maybe you want to give a little gift to your yoga teacher? Whoever it is, they’ll love these cute and customizable little shots! But these shots can be so much more than just a one time gift. They’re an all-around great recipe to make for yourself any time of year to experience the myriad of benefits of apple cider vinegar! So, what are they? 1. It’s a fermented food rich with probiotics! ACV is fermented, thus is has probiotic benefits that help feed your good gut bacteria. This is especially important for a healthy immune system and overall strong constitution. Taking one of these shots in water before a meal can help boost your gastric juices which allows you to better absorb nutrients from your food. Because it supports healthy digestion, it can help to regulate appetite and aid in weight loss. One study cites that consuming vinegar helps to reduce belly fat. and support weight loss. Apple cider vinegar is real, whole food, with real food benefits like antioxidants. 3. It also has many topical benefits. This particular recipe is for consumption, but ACV has tons of topical uses as well. It works great as a toner for your skin, and I use it to remove product build up from my hair with this ACV hair wash! Very Important… You Must Dilute These Shots in Water! This is a very important note about these shots, and every ACV shot… YOU MUST DILUTE IT. You cannot take ACV straight or it will burn your esophagus and cause inflammation. These shots are a bit more diluted as they’re flavored with other juices and not just straight ACV, however, they still need to be diluted. You can make it nice and fancy with sparkling water, or keep it simple with still water. Now that that’s out of the way… let’s talk about the flavors of these shots! These DIY ACV shots are not just straight ACV! They’re flavored with other fruits and spices to add more flavor and nutrients! 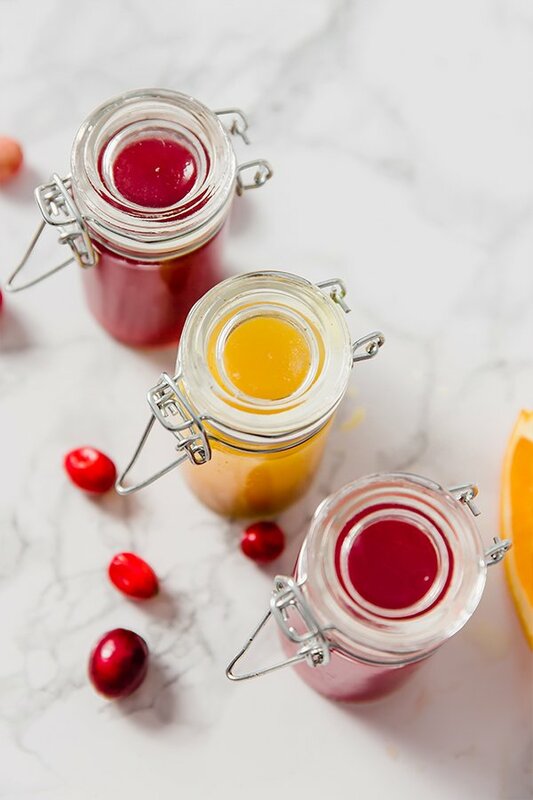 While fruit juice in excess isn’t necessarily health food, these shots only feature a few tablespoons of fresh juice and no added sugar. Orange Cranberry. A classic flavor combination for this time of year! Orange Turmeric Ginger. Turmeric and ginger are anti-inflammatory powerhouses that pair perfectly with the benefits of ACV. Pomegranate Lemon. 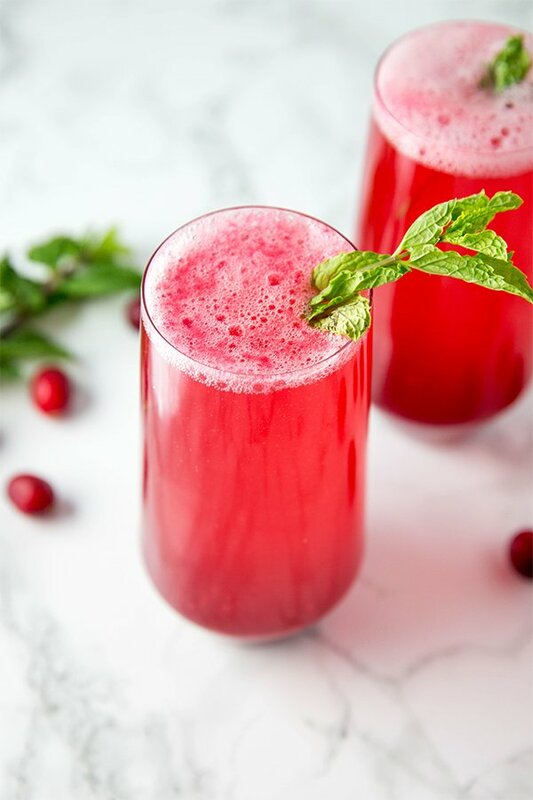 Pomegranate juice is super nutrient dense and antioxidant rich. The lemon flavor pairs well with the pomegranate and ACV. These DIY apple cider vinegar power shots are a nutrient powerhouse! They make perfect DIY gifts and are a must-have to store in your fridge. They’re sugar-free and are easy to make at home! Combine the ingredients in a small glass jar with a lid (like this). Scale the recipe up to fill multiple jars. Store in the fridge and save for yourself or gift to friends. Important – you must dilute each shot in 6-8 oz of regular water or sparkling water! 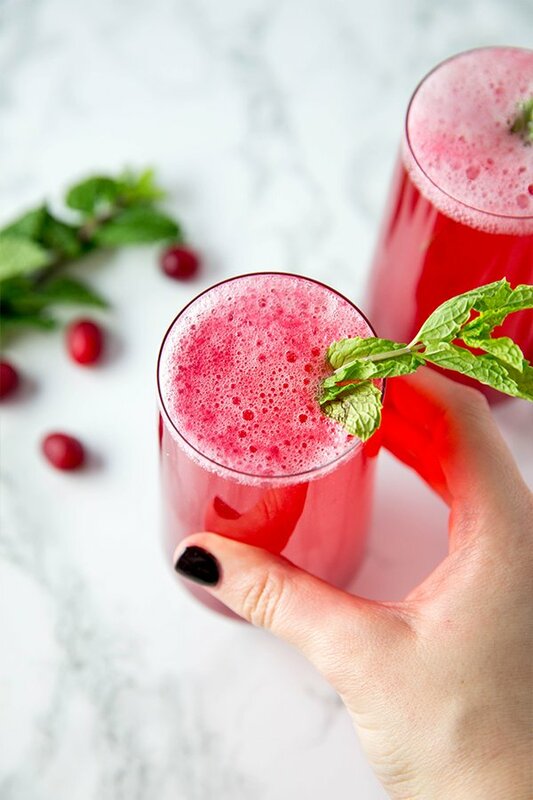 This sparkling cranberry mocktail is a non-alcoholic seasonal drink that everyone will love! It’s paleo, AIP, and kid-friendly. Mocktails are underrated. If you’re abstaining from alcohol, or can’t drink for health reasons mocktails are just so much more fun than just drinking water! I mean, we’ve come a long way with all of the great sparkling water options on the market that are incredibly tasty and convenient, but making your own really gives you a lot of control and impresses your party guests to boot! 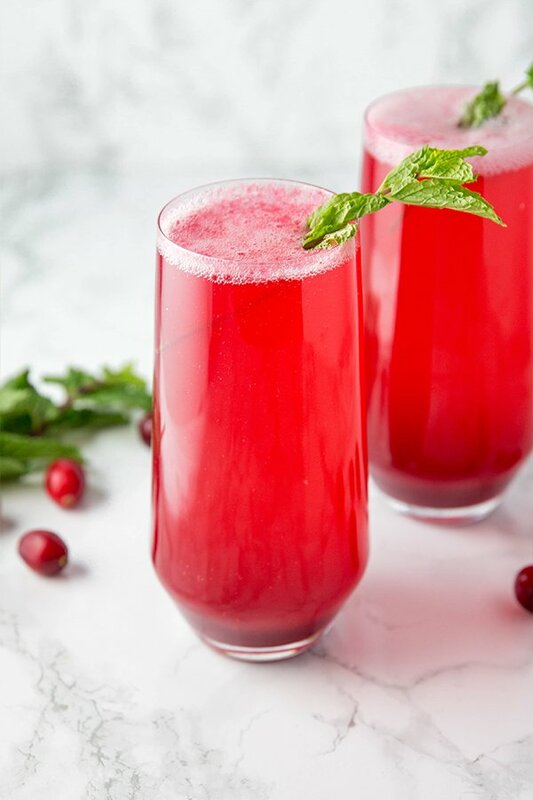 This sparkling cranberry mocktail is perfect for the holidays season. It’s festive, delicious, and is really quite simple and hands off to make. You can scale the recipe up or down depending on how many party guests you have, and both kids and adults will like it! I loved having a fun, fancy drink as a kid and this is perfect for that. But let’s be real… if you can tolerate a bit of alcohol and want to add a little shot of vodka or something like that to this drink, it will totally work! 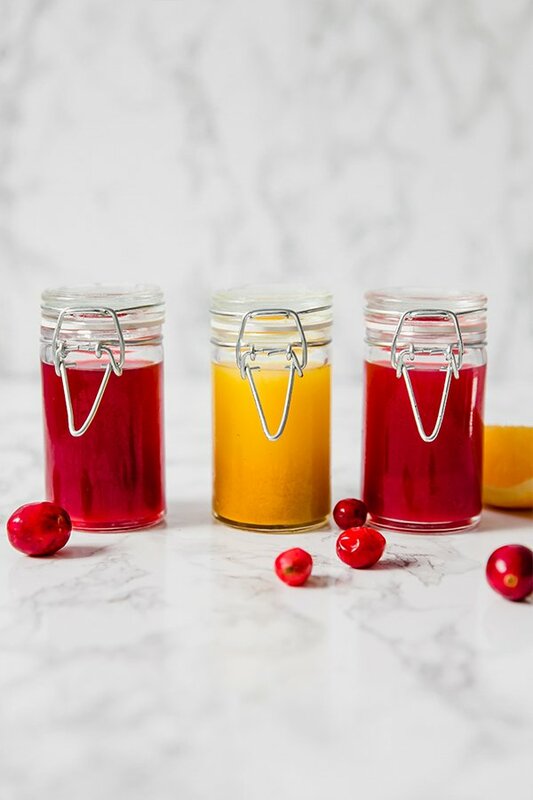 You can likely use frozen cranberries as well but be sure to adjust the liquid as needed. The flavor is subtle but it really adds some nice flavor. Technically, you can use another sweetener or just leave it out all alogether. Just a little bit of lime adds some nice acid and flavor to the drink. Any unflavored sparkling water you have will work! Using a medium-sized sauce pot, combine the cranberries, mint, honey, and 1 cup of fresh water. Stir to combine and increase the heat to a low simmer. Stir often for 10-12 minutes until the cranberries all pop and the mixture reduces. Allow cooling for 10-15 minutes until the mixture is cooled to the touch. 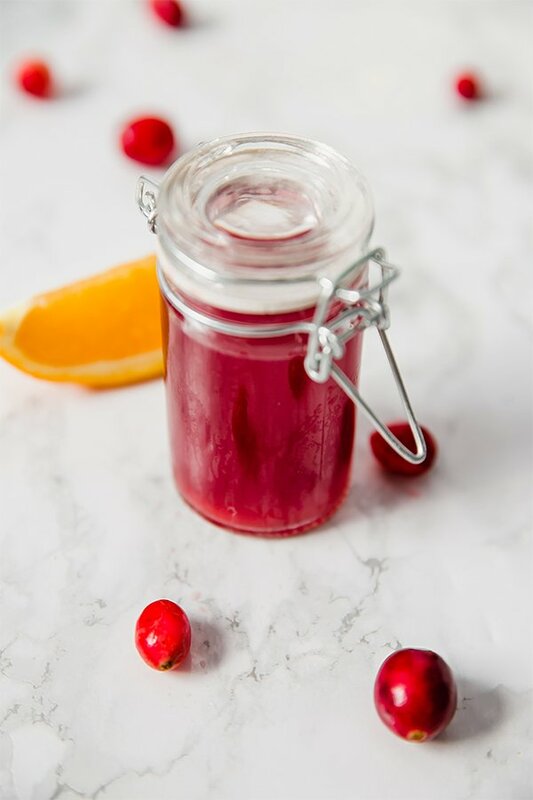 Use a nut milk bag or cheesecloth to strain the cranberry mixture. You should have about 1/2 cup. Divide the mixture between two glasses and add the lime juice and sparkling water to each glass. Mix well and add fresh mint to serve if desired. Serve immediately. This frozen pink lemonade is perfect for summer! It’s refreshing, creamy, and just the right amount of sweet and sour. It’s totally Paleo, AIP and free of refined sugar. 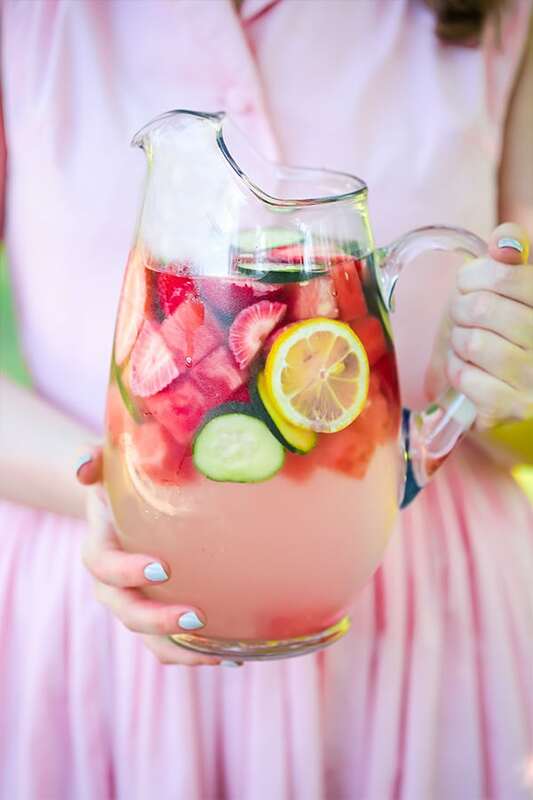 The only thing better than a refreshing lemonade on a hot summer day is pink lemonade! It was one of my summertime go-to’s as a kid, and I always wondered how the heck they made it pink. The lemonade I was drinking was likely made pink from food dyes, so how the heck do you do it naturally without taking away from that sweet and sour flavor of lemonade? This frozen pink lemonade does just that! This lemonade isn’t like a slushie with all ice. Rather, it’s creamy with coconut cream which makes it makes it more like a milkshake. When it comes to frozen drinks, the creamier the better! Fresh lemon juice works much better for lemonade than the stuff you get in a bottle! I recommend juicing fresh lemons either by hand or with a lemon juicer and chilling it in the fridge. This is how you actually make pink lemonade! Not artificial food dyes, but cranberry juice. 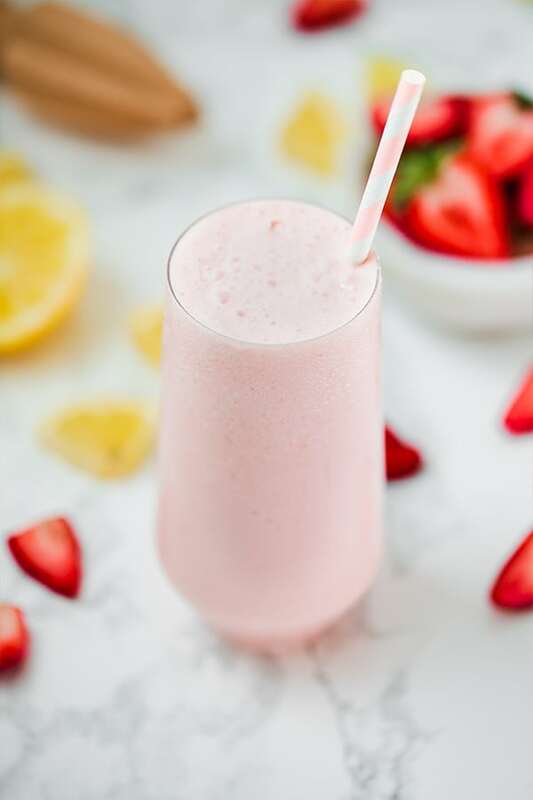 Strawberries add a bit more creaminess to the frozen lemonade and make it sweeter. Coconut cream makes this lemonade nice and creamy! You can place 2 cans of coconut cream in the fridge overnight and use the hardened cream, or you can use this which I prefer! Just a bit of natural sweetener! You can also sub maple syrup here. 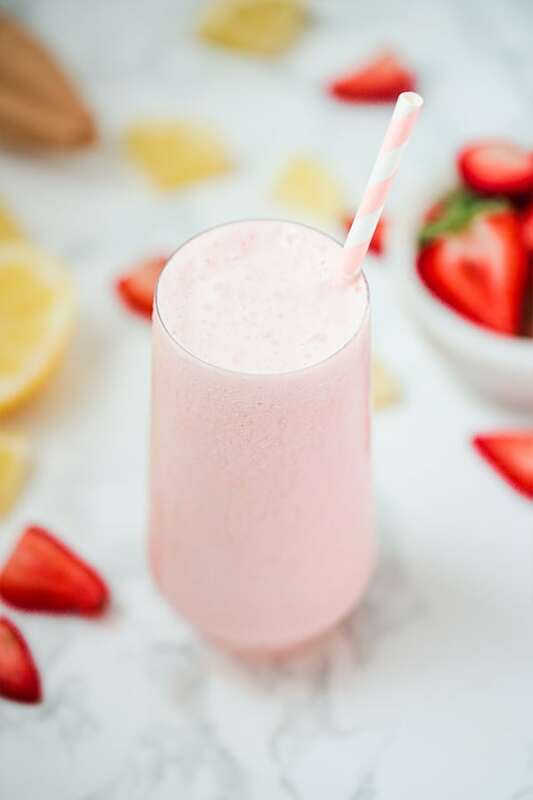 Using a high-speed blender (like a vitamix) blend the lemon juice, cranberry juice, and frozen strawberries until fully incorporated. Add the honey, coconut cream, and ice and blend for 20-30 seconds or until creamy. Spoon the drink into two drinking glasses and serve immediately. Chill all of the ingredients to ensure that the frozen lemonade stays cold! 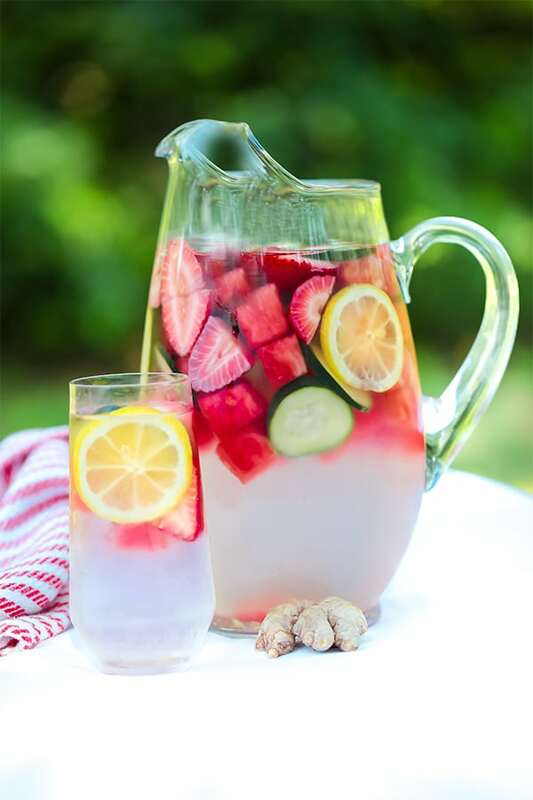 This anti-inflammatory fruit and ginger infused water is the perfect homemade refresher. It’s made with ginger, watermelon, and tons of other fruits and veggies that feature added health benefits. Summertime is here along with picnics, BBQ’s, and dinners on the patio with friends. With high temperatures and warm sunlight, these summer gatherings always feature tons of icy cold beverages. Beer, lemonade, soda, you name it, and the problem is that it’s anything but hydrating and healthy. These classic summertime drinks can dehydrate our body further, and send our blood sugar soaring. I don’t know about you, but joint pain, headaches, and feeling hangry is not the way I want to spend my day at the pool. But let’s face it, sitting at an outdoor gathering with just a cup of water can feel a little bland. 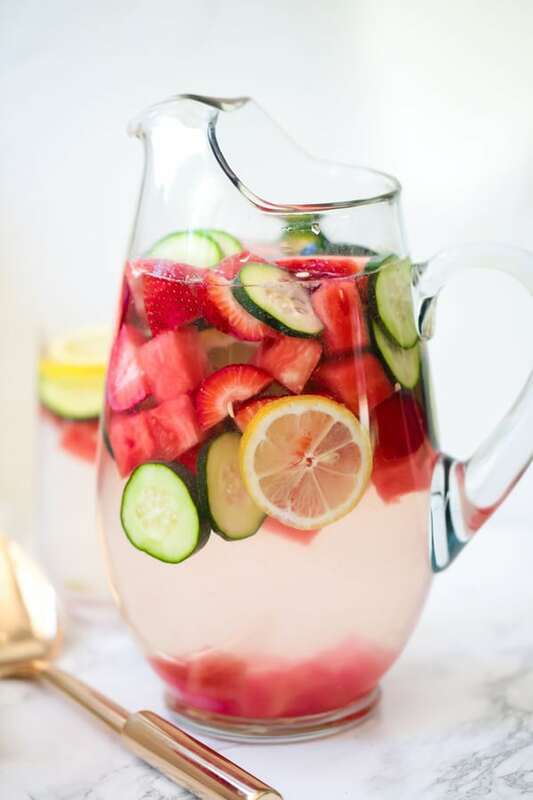 That’s why I’m sharing this yummy infused water recipe! 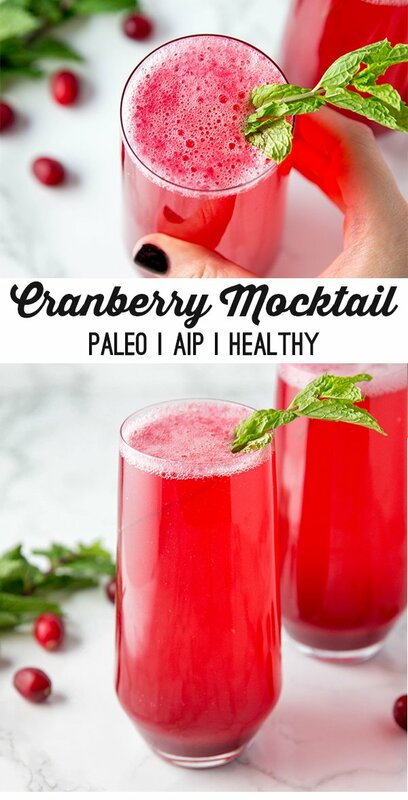 It’s a beautiful and flavorful alternative to a cold soda that features a myriad of health benefits. So, what’s the big deal? Why is this water that much better than a sugary lemonade? Here are just a few reasons why this anti-inflammatory water is a great choice for summer. Hydration from water is key to health. Nothing hydrates us like water does, and drinks like beer, soda, and coffee can actually dehydrate us. Our body needs to stay hydrated to lubricate our joints, support natural detox, and to carry nutrients throughout the body. Dehydration is a serious issue, and we need to stay hydrated to stay healthy and ward off inflammation. The ginger in this water is a powerhouse ingredient. What makes this water especially unique is the grated ginger. Not only does it give it a little spicy kick, but ginger is known to naturally support good digestion and be anti-inflammatory! It’s naturally sweetened with whole fruit slices. Sugar is public enemy number one in the health world these days, and in reality, it’s not wasted energy to be blaming a lot of issues on sugar. Added sugar in something like lemonade or a soda can spike up our blood sugar, which throws off our hormone balance, stress response and tons of other processes in the body. Though you may feel a sugar boost to start, you’ll feel depleted and cranky once it wears off. Unlike other drinks you’d find in the chest cooler at a picnic, this water has zero added sugar. The only sweetness comes from the whole fruit slices! 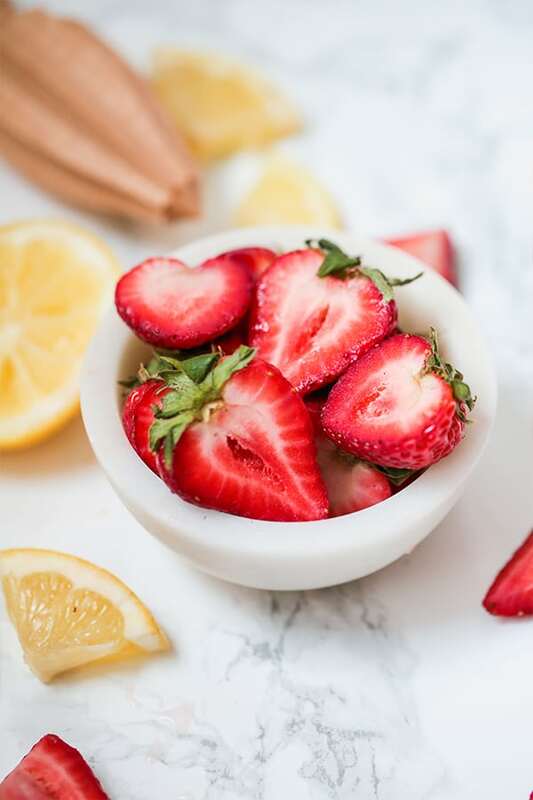 Not only do these fruits taste amazing, but some of the fruits like the strawberries contain powerful antioxidants that fight inflammation. These add a nice sweetness to the water. You can also use other fruits like peach or mango. The lemon adds a light flavor to the water. Ginger is the star anti-inflammatory ingredient here. Since it’s a bit spicy, you may have to scale the amount up or down depending on your tastes. I think 1″ of ginger works great, but you can easily double it. Add in all of the fruits, cucumber, and ginger to a large pitcher. Pour the water over the fruit and mix well. Allow chilling in the fridge for 2-4 hours before serving. Mix well and serve with a large ladle or spoon to scoop out the fruit and ginger into glasses. Add ice if needed. 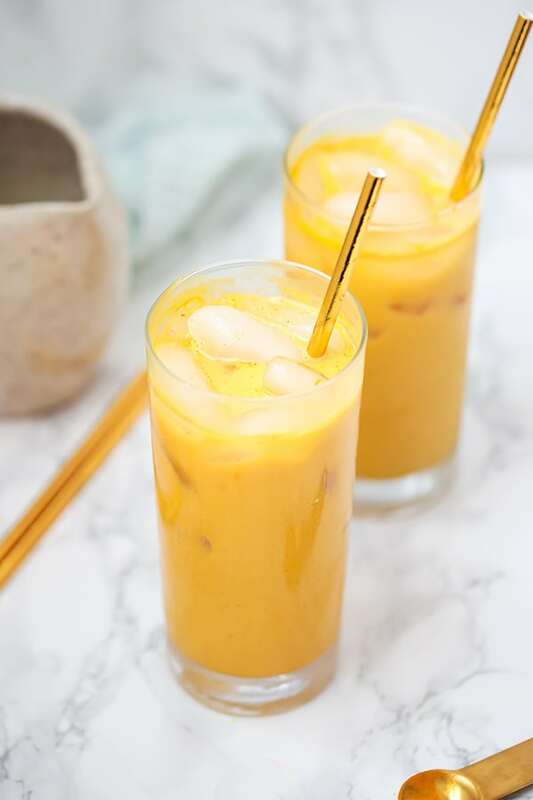 This iced turmeric golden milk latte is the perfect anti-inflammatory drink! It’s paleo, AIP, and vegan. Turmeric is one of my all-time favorite ingredients! It has amazing flavor, beautiful color, and incredible anti-inflammatory qualities. I use it in soups, salad dressings, and of course, drinks. 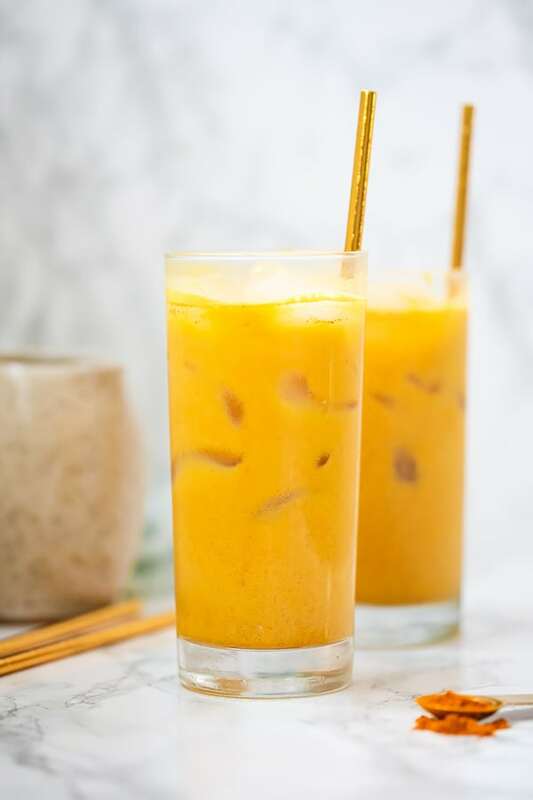 Hot turmeric tea is one of my secret weapon flu busters, and iced turmeric lattes are the perfect summertime drink. 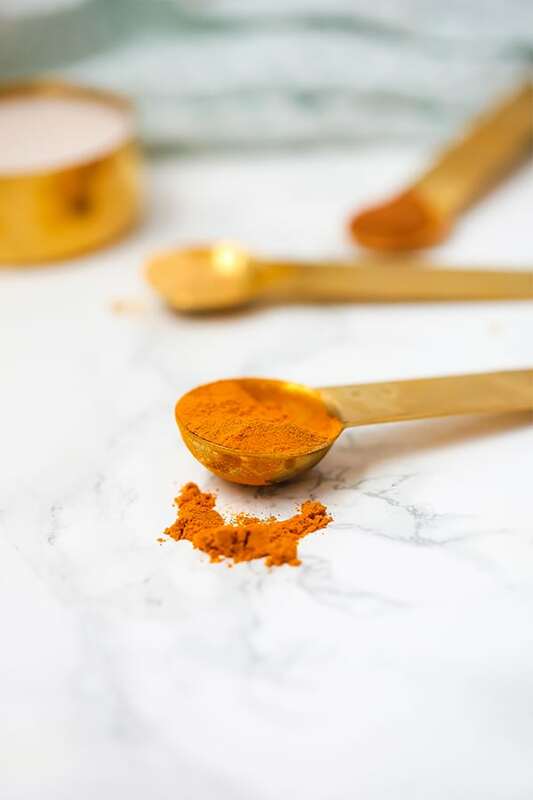 The golden and orange color of turmeric is absolutely gorgeous, which is why it’s often referred to as golden milk. The vibrant color makes this such a fun drink to make and serve. It gives off serious trendy coffee shop vibes, but is easily made at home, and is totally caffeine free. Almond milk from MALK is what I always use for my lattes, but you can also use coconut milk. It’s important to remember that turmeric needs to be paired with black pepper to increase the absorption. This can be omitted for AIP, but it’s preferable to keep it in. Just a pinch doesn’t make the drink taste peppery. And a quick turmeric tip! If you find yourself staining anything in the process of making this drink, remember that turmeric is photosensitive. You can leave anything that gets stained in direct sunlight for several hours to help wash the stain away. It’s a good trick to know when you’re making this turmeric latte several times a week. Ginger gives the drink a bit of a kick. Cinnamon pairs very well with turmeric and adds some sweet undertones to the drink. This adds more of that trendy coffee shop flavor to the drink. Vanilla bean powder needs to be used for AIP. This drink has a lot of strong flavors, so maple syrup helps sweeten it. You can leave it out if you’d rather have it unsweetened, but I highly recommend it. Fill two 8 oz glasses about one-third of the way with ice, and add 1/4 cup of milk to each glass. Using a blender, blend the remainder of the milk with the maple syrup, vanilla, and spices for 5-10 seconds or until evenly combined. 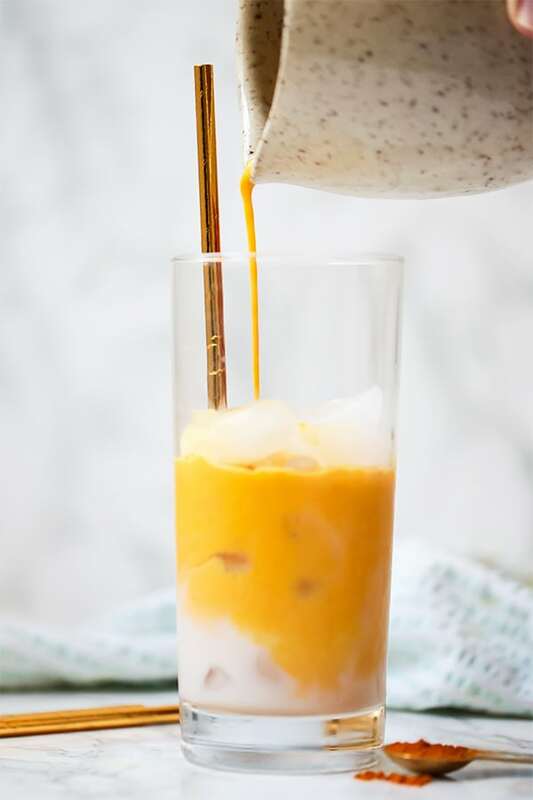 Pour the blended turmeric mixture over the ice (this creates the pretty marbled look when you pour! ), stir, and serve cold. How Often Should You Drink This To See Anti-inflammatory Benefits? Every one is different, but drinking this a few times a week (and even daily if you’d like) is a great way to add some anti-inflammatory turmeric love to your life. I’ve noticed it help with my overall inflammation, and it’s incredible for emergency spot treatment like busting a cold or allergies. If you’d rather mix it up, check out these recipes for more!